A D.C. nonprofit that believes children do some of their best learning outside surrounded by nature says kids growing up in the city shouldn’t miss out on environmental education. Since 1996, City Kids has been showing D.C. kids there’s an entire world outside the city limits, using nature to help students grow, build skills and set goals they’d have never thought were possible before. 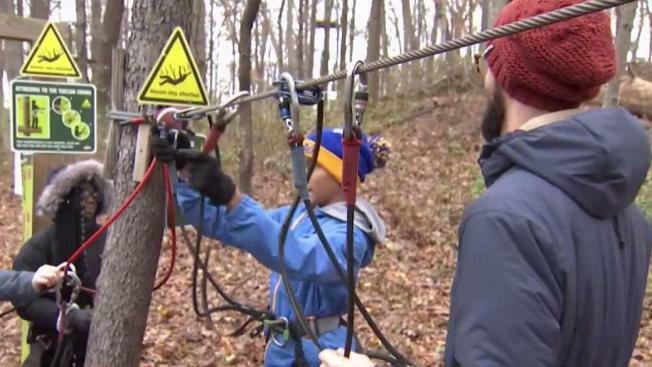 Activities like zip lining at Go Ape in Rockville, Maryland, teach students how to plan, prepare and succeed. “When I first went rock climbing when I was younger, I was like, ‘I don’t want to do this,’ but then I joined City Kids and now I’m like, ‘I want to do this; I want to do that,’” Osaro Nelson said. N’Dea Stewart, a 14-year veteran of the program, knows how important something like it has on D.C. kids. Students can start enrolling in the sixth grade and can stay with the program through high school. Mother Clarice Ulu said that’s a critical time for kids. During the summer, the students will travel to Jackson Hole, Wyoming, and spend a month in Grand Teton National Park. For some students, that will be the first time they’ll ever be on a plane. City Kids also provides tutoring, support and a job-training program for the older students. “Going out doing this every day, it brings a lot to you mentally and physically,” Bullock said. Ninety-five percent of City Kids participants graduate from high school and go on to college and careers.